If you couldn't tell by our work, we love photography and we love people. We love meeting new people and getting to know them. If we don't make some kind of connection with you during or before a photo shoot we haven't completely done our job. Fortunately, Dennis has been doing this for so long that getting people to relax and be themselves in front of the camera is second nature to him. Studio 101 West serves many types of clientèle from fun and energetic high school seniors to business executives, to families with wiggly kids. We've built our business around them and wouldn't want it any other way. When we aren't shooting people (with the camera, that is) Dennis enjoys shooting architecture and photography for businesses, and works hard to keep us current in new trends and technology. We are a dynamic studio with clients all over the nation, but proudly serve our local community here on the Central Coast of California. Family owned and operated since 1988, we've raised two wonderful kids and have maintained a healthy marriage to boot. Based in San Luis Obispo County, California, we travel world-wide as well as nationally, however we are so in love with the central coast and relish the fact that we don't need to go far for a photographic adventure. Our business is about real people and making them look and feel their best. When you choose Studio 101 West as your portrait photographer, you'll not only get beautiful portraits, but you'll contribute back to our local community which we are highly involved in. As a portrait photographer it's my personal goal to create photographs that show the world a little bit about who you are. . . that certain smile or look that your friends and family recognize as the real you. After 25 years of creating thousands upon thousands of family, business, and high school senior portraits, I have a developed a combination of technical abilities and a relaxed, intuitive style that help my photo-sessions be fun and exciting. Still, I strive to push myself by learning and trying new techniques which help me further refine my skills as an artist. When it comes to portraits I have done it all, (well, I don't do nudes so I guess I've almost done it all) from beautiful artistic portraits which hang on your wall, to business portraits for companies like Intel, Sports Illustrated, and Westways Magazine. I have a BA degree in photography from Brooks Institute, but my love of photography started when I was 12 and my mother gave me my first camera just before a family trip to Hawaii. Ever since then I've had a intense interest in creating photographs that people enjoy. 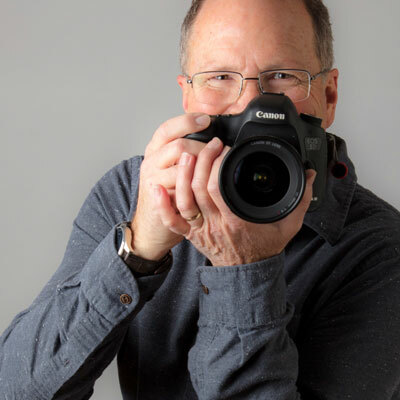 I feel truly blessed to be a full-time professional photographer for over 25 years now. I look forward to the future of photography and I'm always looking for new ways to keep my creative abilities fresh and alive. I haven't been to Hawaii lately but frequent vacations and awesome central coast locations are still a great source of my inspiration.